The Beechcraft King Air B200 twin engine turbo-prop aircraft offer an exceptional level of safety, flying in air-conditioned comfort, with a fully pressurised cabin at cruising altitude (above most weather), providing a smoother experience with reduced air turbulence. Our aircraft are maintained to the highest standard under the Beechcraft maintenance system and are always presented in immaculate condition. 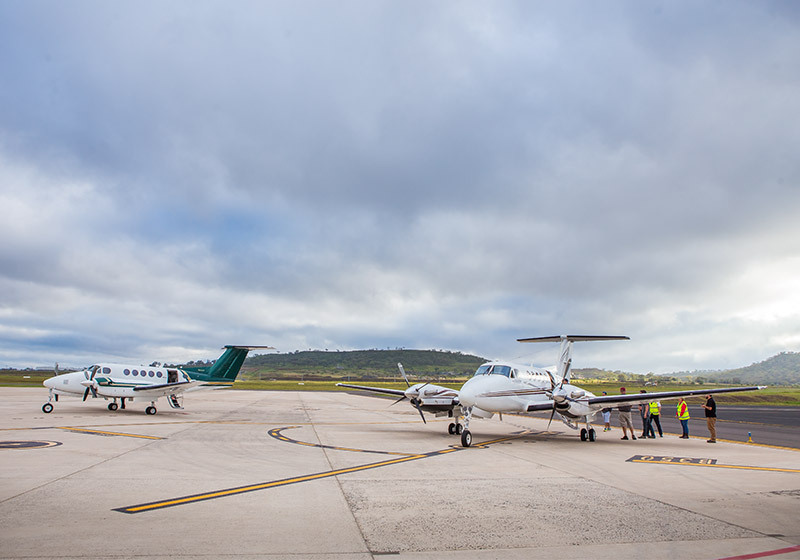 Our pilots complete their mandatory ‘Check and Training’ requirements and are subject to vigorous on-going training procedures in accordance with our training policies. Air Charter Co-ordinators can offer either single, or two pilot, crewed King Air B200 charter flights. Air Charter Co-ordinators operates under AOC (Air Operators Certificate) SQ 410018. Air Charter Co-ordinators King Air on tarmac at Wellcamp Airport.